Over the last few months, bottled water has been the subject of negative headlines as the topic of single-use plastics dominates in the media . Studies by the World Health Organisation have shown that the levels of plastic fibres in popular brands of bottled water could be as much as twice as high as tap water, with 90% containing tiny pieces of plastic. This was just the most recent concern about bottled water, after a whole series of concerns have neem highlighted recently. The issue of plastic bottles and their harmful impact on the health of both the population and the environment was highlighted by this year’s Earth Day (April 22 nd), which focused on ending plastic pollution. This international event sees the involvement of over 1 billion people every year and it was evident this year that the subject of single-use plastic demanded action from many. 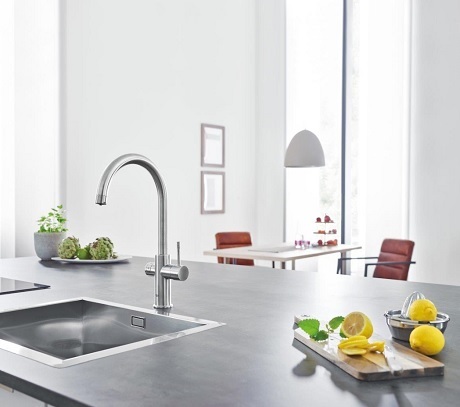 The GROHE Blue Home offers exceptional water quality straight from the tap and with none of the problems of plastic. 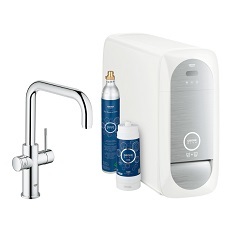 This stylish appliance combines outstanding functionality and convenience with a sophisticated water cooler to provide filtered still and sparkling water directly from the kitchen tap. 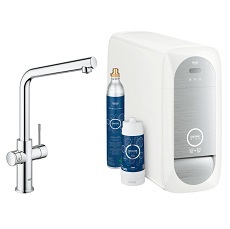 The combination of the five-step filtration process and dual flow spout give GROHE Blue Home water an unrivalled pure taste. 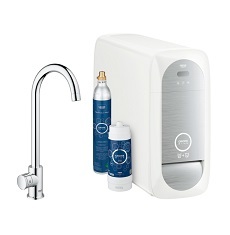 And it is not the unbottled water factor alone that makes GROHE Blue Home such a desirable appliance for the kitchen. With experts recommending that adults drink at least 2ltrs of water per day, the GROHE Blue Home makes it easier than ever to stay hydrated with a refreshing glass of water - whether that’s sparkling, lightly sparking or still. There is also an optional magnesium+ filter, which can provide as much magnesium as four applies in 2ltrs of GROHE Blue Home water.